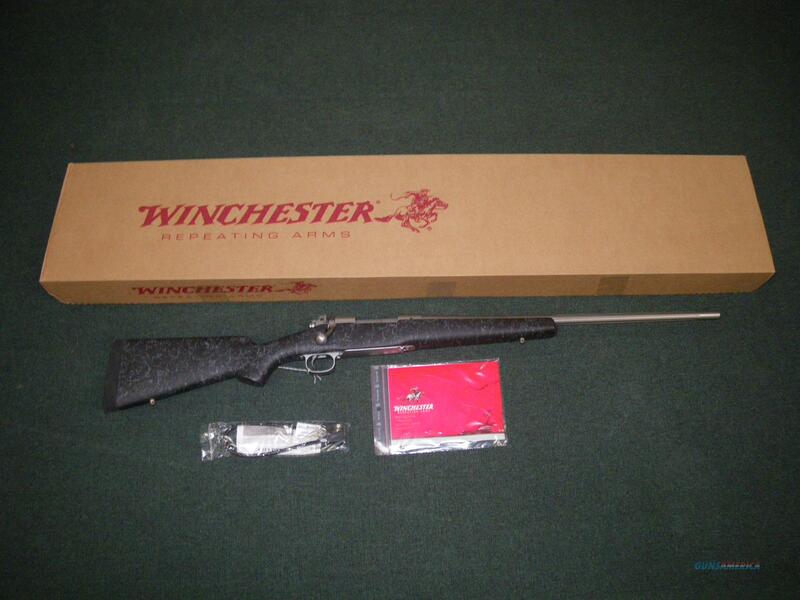 Description: You are bidding on a new Winchester Model 70 Extreme Weather in 308 Winchester with a 22" stainless steel barrel. The Model 70 Extreme Weather Stainless utilizes a Bell and Carlson lay-up composite stock that provides a solid feel and features trim and lightweight ergonomics. It has a textured charcoal gray matte finish for rugged good looks and improved grip in adverse conditions. The sculpted cheekpiece helps insure proper eye-to-scope alignment from any shooting position. The thick, black Pachmayr Decelerator pad helps take the felt recoil bite out of high performance magnum cartridges. Like all Model 70s today, it features the Pre'-64 type claw extractor with Controlled Round Feeding so the cartridge may be easily withdrawn from the chamber at any point after it leaves the magazine. It also means that the cartridge base is grabbed by the claw as it leaves the magazine so it enters the chamber straight, in line. The classic Three-Position Safety offers both on safe and fire positions, plus a middle position that locks the firing pin yet still allows the bolt to be operated, providing a greater margin of safety when checking the chamber condition or unloading. The Extreme Weather SS rifle's free-floating fluted stainless steel barrel is made in the same factory as those found on U.S. military rifles and machine guns, and features a recessed target crown to protect the rifling. The fluted barrel allows us to give you a stiffer barrel profile that does not carry excessive weight. Displayed images are stock photos. Any questions please feel free to ask (our phone number is in the additional information tab above).